One of the things that I really like about pestos is that they are fun and easy to play around with. Despite the fact that they do not have all that many ingredients in them, changing just one or two can completely change the flavour profile of the pesto. 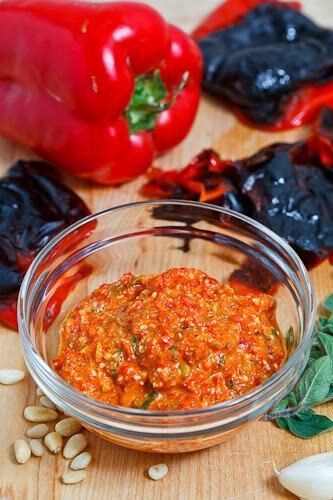 The other day when I was going through my freezer I came across a cache of roasted red peppers that I had frozen back in the fall and I remembered an experiment that I had wanted to try with a roasted red pepper pesto . I don’t tend to use fresh oregano all that often and I had been thinking about new ways to use it when the idea of replacing the basil in a roasted red pepper pesto with some would be particularly nice. Oregano definitely reminds me of Greek cuisine and that got me thinking about other Greek flavours when I thought that some salty feta might help balance out the sweetness of the roasted red peppers and balsamic vinegar. I have to say that I quite enjoyed this use of the fresh oregano in the roasted red pepper pesto! You can use this pesto as a sauce for a pasta or as a condiment and it works rather well as a spread in sandwiches. Sounds like imagination goes a long way! I am sure that this would be quite delicious. Wow! I like it, I'm printing everything and I'll try soon! This is definitely a winner Kevin!!!! There's classic flavors of Greece in this pesto. I like how you've used the red peppers. With pine nuts, garlic and feta…you can't go wrong. I'd like to give this a try on pasta with some juicy roasted chicken. I love roasted red peppers. This would taste great with so many foods. The flavors are swimming through my mind, I can almost taste this. Can I substitute dried oregano? Anonymous: This recipe focuses on the fresh oregano so I would highly recommend going that route. If you do try it with dried, let me know how it goes. I can think of a ton of cooking ideas using this recipe. It would be great tossed with pasta and grilled chicken. I'm also thinking it might be lovely with roasted pork chops.